A fun exhibit of mixed media works of art including hooked rugs, play dough cut outs, drawings on doilies, as well as works on paper and canvas. The Backroom gallery features contemporary abstract painting by Vince Pomilio. FROLIC is a playful and exuberant exhibit of paintings, drawings, hooked rugs and sculpture. Let’s face it, with the economy struggling and prices rising we need to have some amusement to keep our spirits up. This exhibit should do the trick. 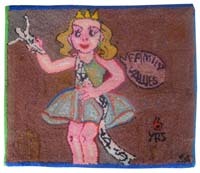 Veteran artist Sally Agee has created a selection of "tabloid" hooked rugs depicting scenes with Jon Benet, black lungs, and condoms. Not your typical hooked rugs. Instead of the flowers and fruit baskets that the other sixty year old women were working on in their hooked rug class she took in 1995, Ms. Agee decided to reflect on more current themes. Her first rugs were inspired by the incessant media coverage of the O.J. Simpson trial. More tabloid rugs followed giving voice to concerns on the environment, interracial love and birth control.Sally Agee graduated from Parsons School of Design, Syracuse University and studied at Epsom College of Art and Design, England. She lives in Brooklyn with her husband Aaron. Jeannie Weissglass shows her work for the first time at Carrie Haddad Gallery. Her vividly colored paintings and drawings playfully depict enigmatic lost worlds. Drawing inspiration from references as diverse as Tantric wall paintings, Hudson River School landscapes and vintage history books, she layers paint and pattern with strong, swirling strokes. In this show, she will be presenting her newest work, a dreamlike, poetic series of landscapes, peopled with cryptic revolutionary-era figures, revealing the unconscious energy of Weissglass's process and American nostalgia of a romanticized past. Jeannie Weissglass was educated at the New York Studio School and L’Ecole des Arts Decoratifs in Nice, France. She has had solo shows at the Ethan Cohen Gallery and Farrell-Pollack Fine Art in New York, and has participated in numerous group shows in New York as well as the Instanbul Biennale in 2005. In 2008, her show PICNIC was the subject of a special pop-up exhibition in New York hosted by Hable Construction. Colleen Kiely works in graphite on little white paper doilies. Cute little still lifes? Hardly. Kiely prefers heavy trucks and cars traveling on the highway. The juxtaposition of the doilies and the rugged vehicles is delightful. Colleen Kiely is a faculty member of Simmons College, MA and is exhibiting with the gallery for the first time. Painter Gabe Brown brings more excitement to the exhibit with her surreal canvases. She was born in Tucson, Arizona and now lives and works New York City and the Hudson Valley. She has studied at Skowhegan School of Painting and Sculpture, and SUNY, Purchase, and has degrees from UC, Davis and The Cooper Union. Brown likes to think of her work as a secret recipe for creating an inner landscape of the human condition. Her narrative vignettes are both alluring and mysterious. Nature, and those things existing in nature become metaphors for a strange and at times super reality; a parallel universe that questions the natural scheme of life itself. Currently an Assistant Professor developing an electronic art program at Union College in Schenectady, NY, Fernando Orellana uses new and traditional media as a way of transmitting concepts that range from generative art to socialpolitical commentary.He has recently exhibited at Espacio Fundación Telefónica, Buenos Aires, Argentina, The Mandeville Gallery, Schenectady, NY, Exit Art, New York, New York, LABoral, Gijon, Spain, The Tang Museum of Art, Saratoga Springs, NY, Glass Curtain Gallery, Chicago, IL, The Ark, Dublin, Ireland, and The Biennial of Electronic Art, Perth, Australia.Orellana received a Master of Fine Art from The Ohio State University and a Bachelor of Fine Art from The School of the Art Institute of Chicago. He was born in El Salvador, San Salvador in 1973.For this exhibit, Orellana has created a high-tech sculpture titled Extruder.He developed Extruder, a machine that makes hundreds of Play-Doh cars, to celebrate, criticize and emulate the automobile, a machine that our culture worships. The ultimate goal of Extruder is to make the total number of automobiles that were made in 1947 (the year Henry Ford died) by the Ford motor company, an estimated 429,674. As you can imagine that is also a whole lot of Play-Doh; about 11 tons. The process will continue until the total number is reached. As the Play-Doh cars are completed, they will be encased in clear epoxy as part of a series of wall hung wooden panels. Varying in size,each panel will have a different number of cars and will be titled according to the corresponding production line number. Last, but not least is Vincent Pomilio, who is warmly welcomed back to the Carrie Haddad Gallery after a 16 year hiatus. Pomilio’s canvases are filled with a cacophony of layered images and color. Some are loosely based on landscape and others are simply developed intuitively during the process of applying paint, then rubbing, sanding, or burnishing each layer. Pomilio describes them as “worlds of refined, chaotic movement animated by color.” His work can be found in countless private and corporate collections across the United States.